Last modified on June 4th, 2018 by Vincy. Autocomplete feature is a typeahead mechanism to show input suggestion to the user. It is a common UI/UX feature in applications to intuitively help the user with input. For example, in an internal messaging system, it will be comfortable if the To-Address field is a typeahead field. By typing on this field the list of selectable autocomplete suggestion could be displayed to the user. Google uses this exceptionally well Google Search keyword suggestion. This is different from the dependent dropdown. Previously, we have seen how to display autocomplete suggestion by collecting data from the database using jQuery AJAX. I called jQuery AJAX function to trigger server request to get the database results based on the data typed on the autocomplete field. In this example, I have implemented the jQuery UI autocomplete to read data from the XML file resource. 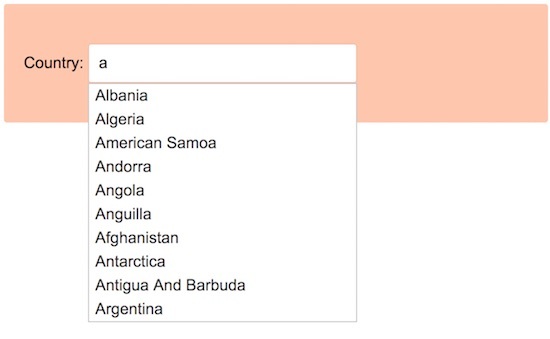 The source XML file contains the country name list which is specified as the source while initializing the jQuery UI autocomplete library function. This is the landing page where the autocomplete input field is displayed. This field id is referred in the jquery selector while initializing the autocomplete function. By typing in this field the jQuery autocomplete function is called to show the suggestion box to the user. We have already seen an example to create Google location search interface with autocomplete feature. 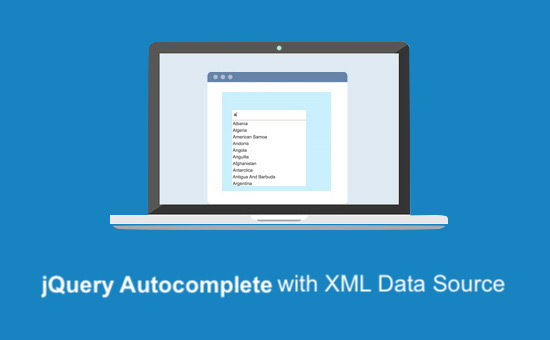 On the keypress event of the autocomplete field, the jQuery autocomplete function is called to read the XML data and display the suggestion box with the related options. The XML file name is specified to the AJAX call to read the country name list into an array. In a previous example, we have seen how to convert an array into XML using PHP. This array data is set to the source parameter of the autocomplete function. From this source data, the autocomplete suggestion options are displayed. This is the XML file data containing the list of country names. This screenshot shows the output of the jQuery UI autocomplete output by reading data from the XML source via AJAX.